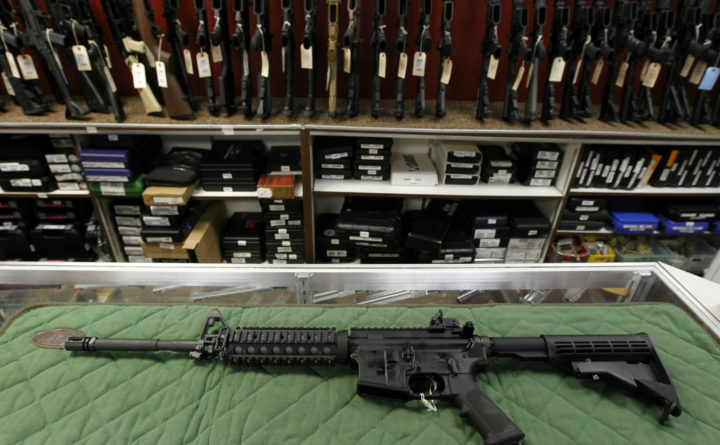 An AR-15-style rifle is displayed at the Firing-Line indoor range and gun shop, in Aurora, Colorado, July 26, 2012. A new poll shows a majority of Americans favor stricter gun laws, and most believe schools and places of worship have become less safe over the last two decades, according to a poll conducted by The Associated Press-NORC Center for Public Affairs Research both before and after last week’s mass shooting at two mosques in New Zealand. In contrast to New Zealand, the United States has enacted few national restrictions in recent years. In part, that’s a reflection of gun rights being enshrined in the U.S. Constitution; in a poll by the Pew Research Center in spring 2017, 74 percent of gun owners said the right to own guns is essential to their own sense of freedom. Overall support for stricter gun laws is unchanged since an AP-NORC poll conducted one year ago, a month after the school shooting in Parkland, Florida, that left 17 people killed. The post-Parkland poll marked an increase in support for stricter gun laws.